Granny NANNIES of Sarasota is dedicated to ensuring you receive the home care you or a loved one require and deserve. Whether you need short-term care, long-term care, or something in-between, caregivers are available 24 hours a day. Call Granny NANNIES at 941-870-7234 for more information. When I needed help with my mom so I could go back to work, I called Granny Nannies. Granny Nannies sent me Aliah. Aliah was such a blessing, she was the sweetest person and a perfect fit for our family. I would call and request Aliah if I need them again. Thanks so much. We would like to express our sincerest appreciation and thanks to the caregivers and the management staff for the kindness and care provided to Mom for nearly two years. Our best wishes to the entire Granny Nannies organization in the future. We highly recommend Granny Nannies for anyone looking for caregiving for loved ones! 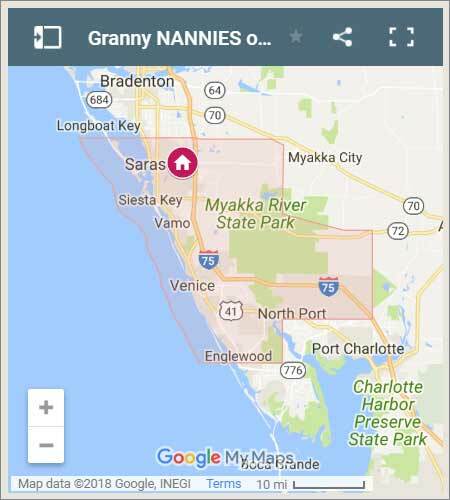 Granny Nannies have helped me with my 94-yr-old Aunt who lives in Assisted Living Memory Care in North Port, FL. Their CNAs took excellent care and were very kind to my Aunt after cataract removal. I really appreciated their professionalism and timely arrivals, including Marilyn, Jaranda and Nataliya. Can't say enough how great all three were. In addition, Jerrica has done a great job visiting weekly and taking my Aunt for lunch and to the park. Call us today at 941-870-7234, and we'll be happy to discuss options on what we can do for you!